By Tina Hodgkinson www.guidedwalksinlondon.co.uk: Bedford Park in Chiswick, West London is a rather special place, it has the distinction of being the first Garden Suburb. It optimises the best of suburban living, with tree lined streets, attractive houses and community facilities, all within a short commute to central London. The Bedford Park Festival is held annually in June and offers a variety of events including musical performances, talks, children’s activities and exhibitions. I first "discovered" Bedford Park a few years ago when I was attending a London architecture course and I was curious to visit. I attended a fascinating walk round Bedford Park, led by John Scott and Pamela Bickley, with anecdotes and stories about the history of the area and its former famous residents. 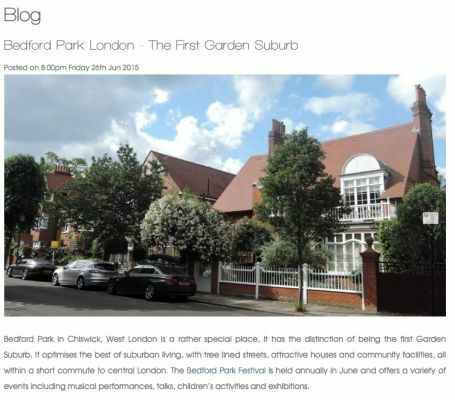 One of the highlights for me is the Bedford Park Open Gardens, which is similar to the Open Garden Squares weekend and I highly recommend it. With the aid of a map, you can visit about 15 delightful private gardens dotted around the estate and partake of tea and cake in the church hall. While it's popular with locals, it's still relatively off the radar to most Londoners and visitors which for me just adds to its charm, but you can be assured of a warm welcome and it's fun to see the diversity of gardening designs. 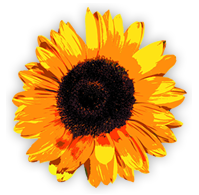 The Bedford Park Festival was launched in 1967 by the vicar of St Michael & All Angels, Jack Jenner, and its appeal committee to celebrate the arts, raise money for repairs to the church and “foster a spirit of friendliness and community”. The Bedford Park Festival has had a profound effect on its community – it helped save the area from developers. In 1967, Victorian buildings were out of fashion, the area was run down, and some of the largest and finest houses had been demolished to make way for modern blocks of flats. See The Exhibition That Saved Bedford Park. The Bedford Park Society was formed in 1963 by two local residents: Harry Taylor, a community activist, and Tom Greeves, conservationist and architect, with John Betjeman, the poet and heritage campaigner, as the Society’s first patron. They were horrified by the rash of demolition and inappropriate development and decided to act after a large Norman Shaw house in Bedford Road was replaced by a yellow-brick, flat-roofed old people’s home – the antithesis of the suburb’s steep roofs, red tiles and gables. Although the Society grew to 200 members in its first year, Greeves was aware that the only real protection for Bedford Park lay in statutory listing for the buildings. The breakthrough came with an exhibition staged in the Vicarage as part of the first Bedford Park Festival in 1967, highlighting the history of Bedford Park and the dangers it faced. One visitor was a Ministry of Housing & Local Government inspector, who was so impressed that within a month he recommended the Grade II listing of 356 buildings, including the former Stores (now offices), the Tabard Inn, the Club (now the London Buddhist Vihara), the Church of St Michael and All Angels and its Parish Hall. A few years later both Ealing and Hounslow councils designated Bedford Park a conservation area. John Betjeman was the first patron of the Festival as well as the Society. He said Bedford Park was "the most significant suburb built in the last century, probably the most significant in the Western world". He called its parish church, St Michael & All Angels, "a very lovely church and a fine example of Norman Shaw's work"
You can read the full story in the biography of John Betjeman by Bevis Hillier and we celebrated the 50th anniversary of this achievement, during the Festival's Golden Jubilee in 2017.